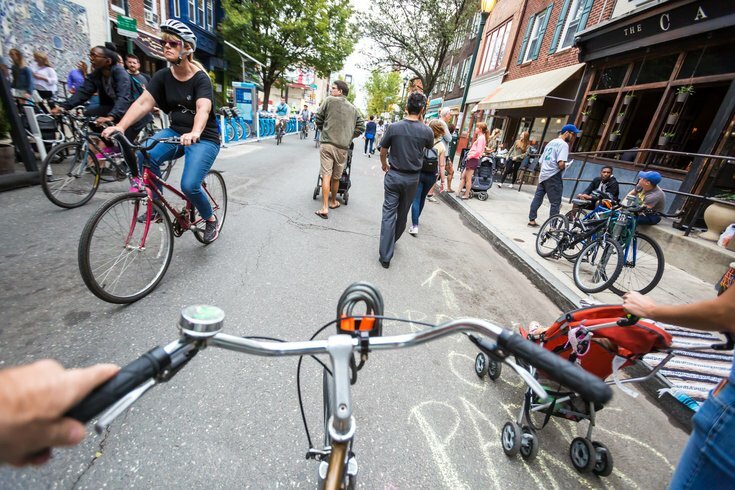 Pedestrians and cyclists enjoyed a vehicle-free South Street between the Delaware and Schuylkill Rivers during the Philadelphia Free Streets event on Sept. 24, 2016. Miles of smiles lined South Street and beyond Saturday. The joy was the result of the inaugural Philly Free Streets organized by the City's Office of Transportation and Infrastructure System. South Street, from the Delaware River to the Schuylkill River, was free of cars. A few vehicles whose drivers didn’t heed the no parking signs were towed Saturday morning. 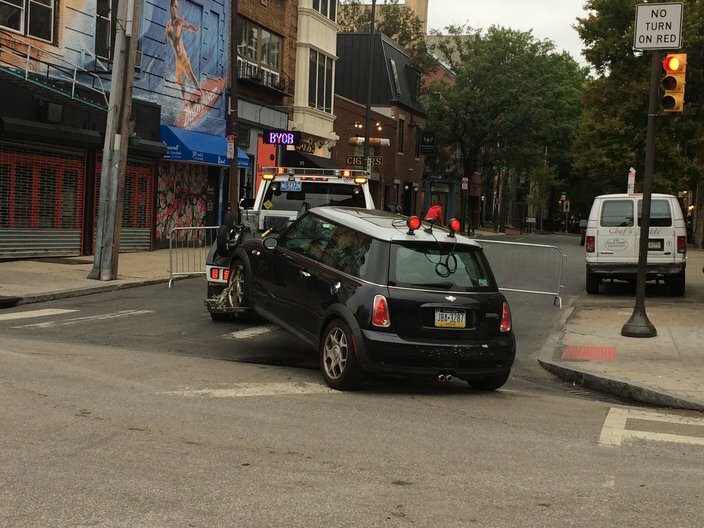 A car gets towed off of South Street to make way for Philly Free Streets on Sept. 24, 2016. Walkers, runners and cyclists headed up and down the route on South onto the Schuylkill River Trail and on into Fairmount Park, eventually ending at the Falls Bridge. Pedestrians and cyclists on South Street during Philly Free Streets on Sept. 24, 2016. While South Street was closed, cops lined cross streets, allowing vehicles to get by. Just to make sure everyone got off on the right foot, James Burns of Philly’s Mural Arts program was chalking a giant arrow, pointing the way. Jeanine Dowd, a veteran marathoner, and her friend, Vicki Dott, getting ready for her first half-marathon, and both from Williamstown in South Jersey, decided to come at the last minute, making plans to run just the night before. They were thrilled, having never experienced Philly in quite the same way. They ran South Street several times. Meanwhile, others danced, listened to music, pedaled and strolled. A Ben Franklin re-enactor rode a bike, and made a cell phone call. Marilyn and Dan Garlen, city residents who’d loved walking over an empty Ben Franklin Bridge when Pope Francis visited Philly last fall, enjoyed re-experiencing the ability to walk an empty city street. In fact, they did a scavenger hunt, walking down South Street and getting a “passport” stamped. “We think it is a great idea,” said Marilyn. And it was great that it was free to participate, added Dan. The city did not yet have an estimate on costs or hours spent on the event, which was endorsed by Mayor Jim Kenney before he took office. 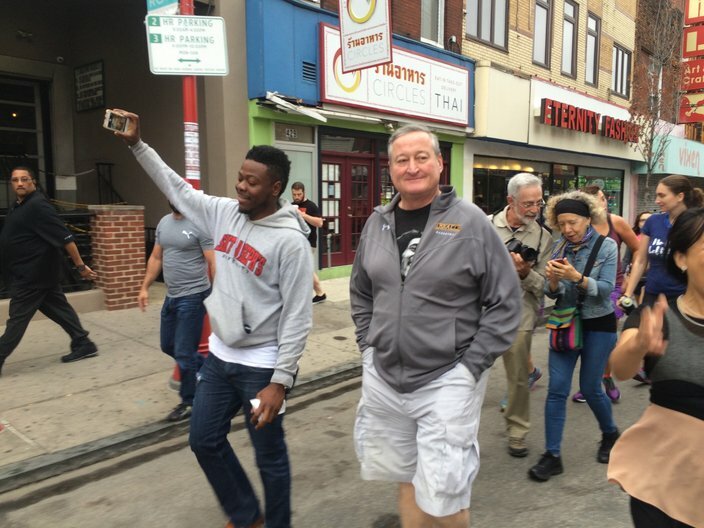 Mayor Jim Kenney walks down South Street during Philly Free Streets on Sept. 24, 2016. Sporting a voluminous pair of cargo shorts and a Bob Marley T-shirt, Kenney stepped off down South with a group of walkers at around 9 a.m., just as a light drizzle began. And while there will be costs, such as for police and the streets department blocking roads, 400 volunteers kept the price tag lower. Roojou and Rob Terry of Northern Liberties approved. Strolling along South, they let their 3-year-old daughter freely roam on her scooter. 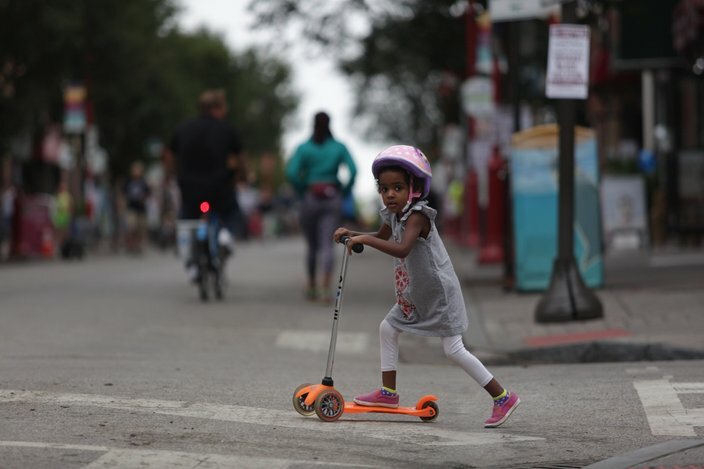 Sanaya Terry, 3, rides her scooter on South Street during Philly Free Streets on Sept. 24, 2016. Sarah Clark Stuart, executive director of one of the organizing groups, the Bicycle Coalition, beamed all morning. “It’s fantastic. This is glorious. So many people are having fun!” she said. “They are savoring real estate they don’t get to experience,” she said. 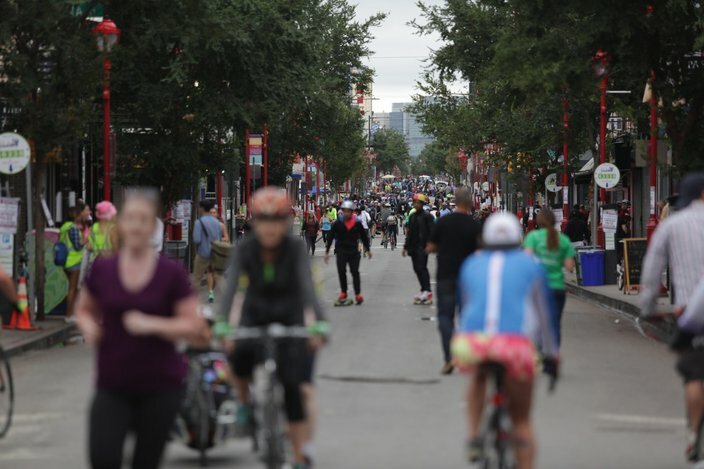 The city is considering adding additional "free streets" events in the future after evaluating the inaugural day.